An old friend has drawn attention to a religious procession in Italy that was disrupted by youths shouting abuse. Ironically, the procession was taking place in a small town whose only significance seems to be that it was host to a thriving underground press during World war II. The report is accordingly not published in the mainstream media but appears in “Breitbart”, an outlet with a reputation for stirring up trouble. Nevertheless, the report seems factual enough and we certainly don’t want any cover-ups. Not when we are talking about a town that so valiantly championed free speech. Dr Alexander Lucie-Smith, however, has taken a slightly alarming stance and invoked the memory of the battle of Lepanto. “May the Blessed Virgin Mary intercede for them…. as she did at Lepanto”. The battle took place in 1571 and is famous for two reasons- the first is that it was the last galley-battle, and certainly as impressive and decisive as the Battle of Actium which ushered in the reign of the Caesars, and the second is that it stopped the European advance of the Ottomans. I would certainly second Alexander’s appeal to prayer but it must be a prayer for peace, not for victory. I cannot see that there really needs to be a conflict between Christianity and Islam and I think we should work harder to ensure that such conflicts as emerge do not take on this tone. In an increasingly secular society, Christianity and Islam are actually in the same business and should support one another. The details and reasons for the battle of Lepanto are interesting. Setting aside the conflict between Christianity and Islam which I am sure is the main point of Alexander’s appeal, there were very good moral reasons to engage the Turkish commander who had broken his word. When the Venetians surrendered on Cyprus in 1750, and Nicosia was captured, the Ottoman commander, from Bosnia, Lara Kara Mustapha Pasha broke his word and first imprisoned and then tortured and executed Marco Antonio Bragadin, Astorre Baglioni, Alvise Martinengo and Gianantonia Querini. He had their heads hung around his own galley as he advanced towards Corfu where he lay waste to local villages. 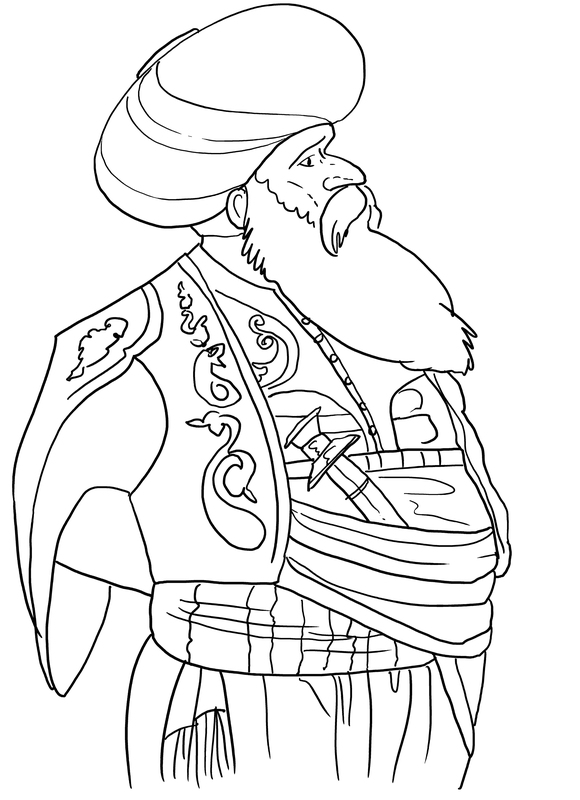 Here is a picture of Lala Mustafa Pasha. 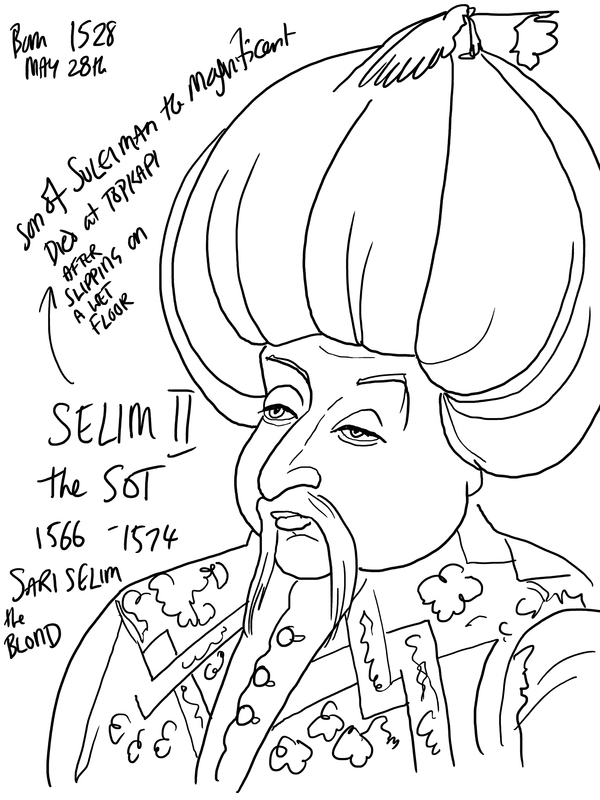 His tomb is in the courtyard of one of Sinan’s mosques, the Ayub Mosque in Istanbul. So far, the moral high ground, but this seems lost when we learn that in the Gulf of Patras, it is the Christian ships led by John of Austria who attack first. Odd, because they did not have the advantage and nor, incidentally was there a favourable wind. There was, however, a measured success with 210 Ottoman ships destroyed, though the Christian fleet also suffered significant losses. The commander of the Ottoman fleet, Uluç Ali at some point captured the Maltese flag and 6 galleys. He made it back to Constantinople with the flag which he gave to Sultan Selim II and was rewarded with the title kιlιç, becoming thereafter Kιlιç Ali Pasha. A number of flags were taken from the Ottoman fleet and for many years hung in Catholic Churches around Italy.Next to the tomb of Pius V in Santa Maria Maggiore there was one flag which was returned to Istanbul as a gesture of friendship. We need more of these gestures, frankly, and less whipping up of stories involving silly uninformed children calling out names. More kindness and better education in other words! While the ships were fairly easily replaced, the Ottoman navy struggled to make up the men to staff a new fleet. By 1574, they had, however, retaken the cities of Tunis and Fez, giving access to Morocco which led to the ascent of Suleyman the Magnificent. So much for history. Now to the Miracle: Just before the fleet set sail, the Pope, Pius V presented the commander of the Christian fleet with an icon of Our Lady of Guadalupe. It was placed in the chapel on the admiral’s ship. At the moment when the Christian fleet attacked, the Pope was leading prayers of the rosary in the Basilica of Santa Maria Maggiore. The prayers continued throughout the day as the battle raged near Greece. 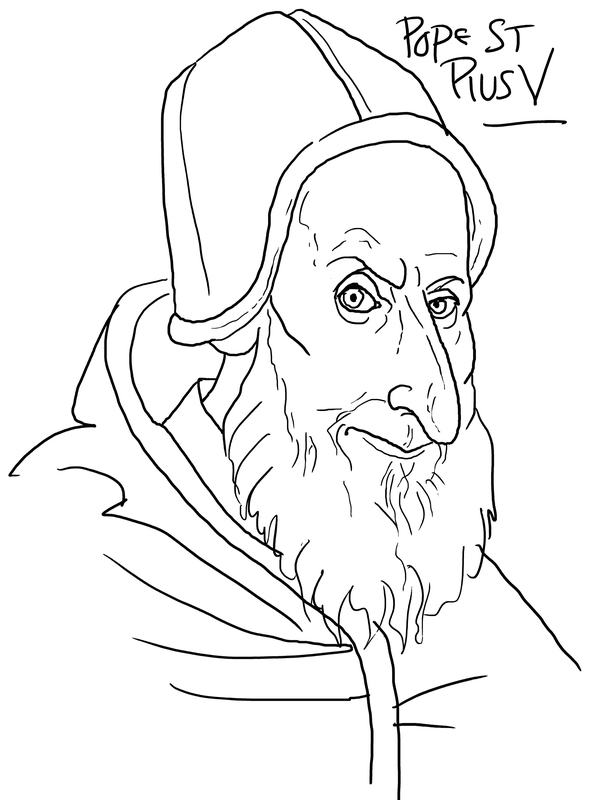 It is because of the battle of Lepanto and the perceived efficacy of the rosary that Pius V decreed the Rosary should be part of the Vatican Mass on every 7th October, to celebrate the Victory of Lepanto. His successor established the feast of the Most Holy Rosary in local Italian churches. The rosary was invoked again as the reason for the failure of the Ottomans to invade Vienna. That and the skill of John Sobieski, the King of Poland. In 1683, following the siege of Vienna, Pope Innocent XI consecrated Sept 12th to the Holy Name of Mary. The further defeat of the Ottomans by Prince Eugene on August 5th 1716, the feast of Our Lady of the Snows, encouraged Pope Clement XI to extend the Feast of the Rosary to the whole Church. There is more that unites Islam and Christianity than divides it. The use of prayer beads, however, is not specific to Catholicism. Indeed, the Catholic rosary of 59 beads dates from around 1520, so the Islamic rosary, the Tasbih, Misbaha or subha/ supha of 33 or 99 beads, which traditionally goes back to the time of the Prophet, certainly predates the Catholic Rosary. The name Supha comes from the arabic to announce, and the rosary beads announce the glory of God whose name is invoked either at the end of each chain or indeed with every bead. The prayers, though, are less formal. However, the Orthodox prayer rope, κομποσκοίνι, from which we get the word “Komboloi”, is said to go back to the origins of Christian monasticism in the desert and to either St Pachomius or the founder of Monasticism himself, St Anthony. this is a rope of 100 knots and is today linked to the practice of the “Jesus Prayer”, a repetitive meditation made famous by perhaps by Gregory Palamas and certainly by Russian mystics in the 19th century. In other words, rosary-beads have a fairly universal significance. We should make use of that fact! On Sunday morning, a group of young Muslim immigrants interrupted a Catholic procession in honor of the Virgin Mary with verbal insults, shouting, and threats as the group passed in front of the Islamic Cultural Center in Conselice, a small town in lower Romagna. In predominantly Catholic Italy, the month of May is dedicated to the traditional processions carrying a statue or image of the Madonna, usually accompanied by the singing of hymns and praying of the rosary. 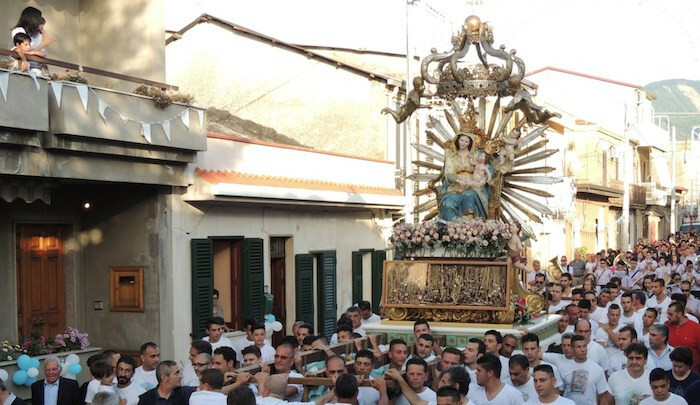 The Marian procession is a tradition in Conselice, and every year, the faithful gather at the Piazza Foresti and then proceed along a number of streets including the Via Dante Alighieri, which also passes in front of the Islamic Cultural Center. On Sunday, after the 9:30 a.m. Mass, a group of 100 faithful, including several small children preparing to receive their first Holy Communion, began the procession as usual. Apparently understanding the procession to be a provocation, a group of Muslim youth from the Islamic Center began hurling verbal abuse and threats at the passing procession. The participants, especially the children, were reportedly stunned and confused; they halted the procession before regrouping and hurrying past the Center. After receiving complaints from members of St. Martin’s parish, the mayor of Conselice, Paola Pula, met with representatives of the Attadamun Islamic Cultural Center on Tuesday morning. Following the meeting, the Islamic Center prepared a formal letter of apology and delivered one copy to the mayor and another to the members of the parish. In a statement, the mayor said that “the incident, even if it concerns the behavior of minors, is intolerable and must not be underestimated.” She also said the youth involved have been reprimanded by representatives of the center. Sometimes I just feel as though there is no real progression. Alexander Lucie Smith is another Old Ratcliffian.